A couple of years ago I spent a week making friends with a fellow named Mike Fruergaard, a Danish traveler and author, who was staying in our La Posada Del Sol Hotel in Samaipata, Bolivia. 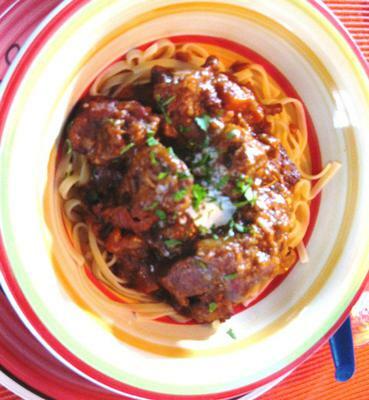 When I found, after a few refreshments at the bar in our La Luna Verde Restaurant, that he was writing a traveler’s diary-style cookbook, I asked him to do some research and assist me in improving my Hungarian goulash recipe. It was a nice dish at the time, but it just didn’t have that boom I wanted. So what Mike did was spend two days investigating online the history of the dish, and the preparations of that dish that are the most famous in the world. He discovered that it is really an ancient recipe traditionally cooked over wood fires in big cast iron cauldrons. (You can do it this way at home, but Chef Trent always cooks it on a stove!) It was a peasant concoction in those days that was considered humble food, one they liked to give it a spicy kick. He read my goulash formula, made recommendations and we immediately repaired to the laboratory/kitchen to give them a whirl along with our own spur of the moment strokes of genius The following recipe arose and later became our signature Hungarian Smoked Paprika Goulash. Mike actually dedicated a chapter in his book, "Dinner With Friends", to me and to the fun we had in the kitchen. There, you can also find the recipe, although I have tweaked it a bit to help our Bolivian cooks adapt. You can order his product as an e-book download on smashwords.com. He is in Demark and they have no loyalties to Amazon there! Take some time and try this yummy stuff. If you have no time and are in some big hurry, you need to slow down like we do here in Bolivia! But if you just cannot do so, come to our La Luna Verde Restaurant and have a bowl there! 1. Put the paprika and cumin in a hot skillet until smoking well then remove immediately before it scorches. 2. Mix salt, black pepper and flour in a bowl then coat beef cubes. 4. Fry a few at a time only then save onto a plate or bowl. 5. Mix very well with the smoked paprika and cumin and let rest there for a while. 6. Sauté onion and garlic in the same oil as the meat until soft, loosening as you stir the crusty pieces from the bottom for flavor. 7. Deglaze the pan with red wine. 8. 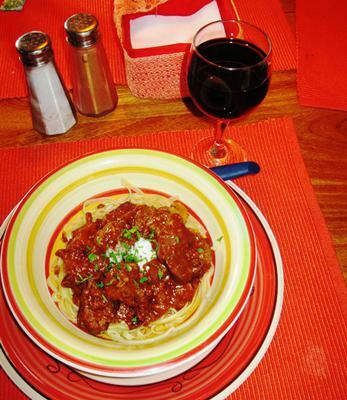 Put meat with wine mixture on top into a slow-cooker, crockpot. (If you live in Bolivia where there are not many of those, no problem! Use a big pot on the stove top and continue to follow the recipe). 9. Mix all the other ingredients in a large bowl and pour on top of the meat without stirring. (If you are using a pot on stovetop, give it a good stir. 10. Cook in crockpot on high for 8 hours or on stove top on very low heat to keep from scorching until meat is very tender. Stir occasionally on stove top but NOT in slow-cooker. It will lose the heat and extend cooking time! 11. Serve in large bowls with on top of your favorite carbohydrate: we use fettuccini in La Luna Verde but white rice or mashed potatoes are great. 12. Top with a spoonful of sour cream or natural yogurt and garnish with fresh parsley. While you are dining, imagine like Chef Trent does that you are in Hungary in the fresh, mountain air, outdoors, dining and laughing over a good bottle of wine with those peasants of long ago. Even if your friends sharing your goulash are not exactly peasants, they will love your new recipe all the same I promise!